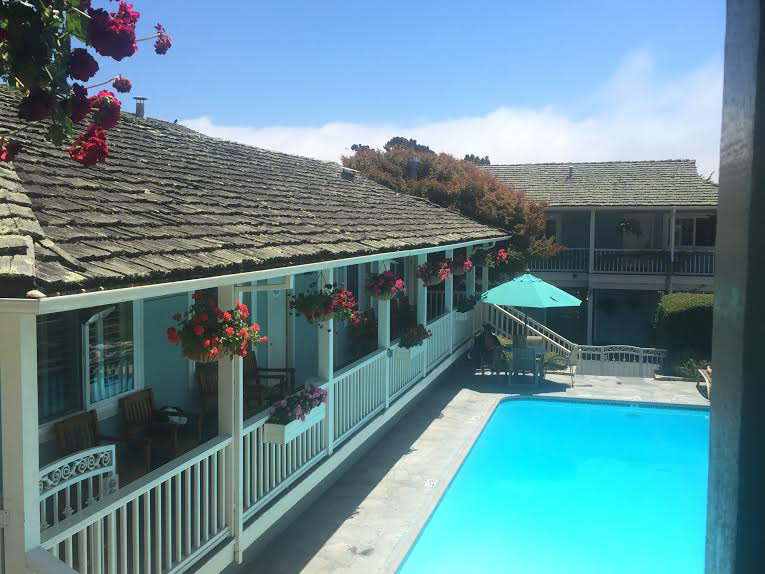 At the Carmel Bay View Inn comfort and convenience join together and you find yourself centered in Carmel by the Sea village overlooking Devendorf Park then out to the Carmel Bay. Here you can enjoy mild Carmel weather on an outdoor deck and by the heated pool. The hotel has an elevator, a rare amenity in Carmel and desired by many. Continental breakfast served every morning in the dining room. Located in walking distance to many shops and restaurants and to beautiful Carmel Beach and Ocean Avenue. Rooms have Queen beds, King beds and fireplaces, many come with with ocean views and balcony. Enjoy rooms with 2 queen beds or are a junior suite with King bed, fireplace, distant ocean view and double sofa sleeper for families and small groups. Select your preferred accommodations from nicely decorated and freshly appointed guestrooms. Use a free local reservation service to arrange a special room for your visit or to block rooms for your wedding, reunion or other group event. You will be provided with great event sites and group hotel room blocks for everyone in your party right away! Several fabulous restaurants that accept private parties are within an easy walk of the hotel plus other lovely event sites and venues are nearby.